1. Preheat the oven to 200°C, gas mark 6 and put a baking sheet in to heat up. Warm 1 tbsp oil in a frying pan over a medium heat, then add the onions. Season and cook, stirring often, for 10 minutes, until golden. Add the garlic and cook for a further 1-2 minutes. Leave to cool. 2. On a lightly floured surface scattered with the fennel seeds, roll the pastry into a circle a little larger than 26cm. Place, seed-side up, onto a second baking sheet. Using a 26cm plate as a template, trim the pastry to a perfect round. Discard the trimmings. 3. Leaving a 1cm border, spread the cooled onions and garlic over the pastry. 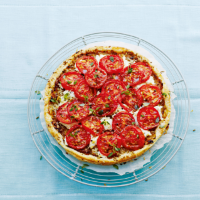 Dot with spoonfuls of ricotta, sprinkle with the pecorino, then top with the tomatoes. Season with black pepper, then drizzle with the remaining olive oil. 4. Place the tart on its baking sheet into the oven, on top of the sheet that has been heating up – this will make the base crisp. Bake for 20-25 minutes until the pastry is puffed and golden. Drizzle with a little more oil and sprinkle with thyme before serving hot or cold. Great with a dressed rocket salad.